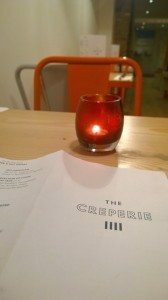 When The Creperie opened it’s doors in March 2014 for Shrove Tuesday, Brighton bloggers, foodies and locals were all keen to check it out. Located on the seafront end of Ship St in The Lanes, The Creperie served a range of galettes, crepes, cold wraps, hot wraps and Gelato and sorbet from the local legend Gelato Gusto for those warm summer days. Now most people think of crepes and galettes and consider them both a daytime thing. 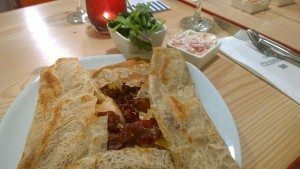 The Creperie think differently, and are open for dinner Wednesday to Saturday for their Dinner Club where you can get a galette and a glass of wine for just £6.50. If you can’t make the dinner club then try out the Breakfast Club – A Bacon and Egg Galette with an orange juice and a Small Batch coffee also for just £6.50 – what a steal! It’s also nice to have something central that’s open late where you can get a quick, late night dessert after watching a show or a film, before heading home. We need more places like this in Brighton don’t you think? 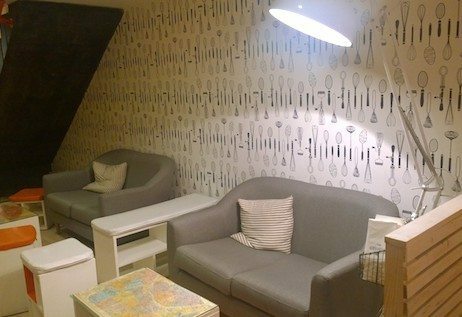 One of the first things that people notice about The Creperie is the creative and attractive, yet minimalistic interior throughout. Designed by a couple of designers straight out of University, the restaurant is decorated with bold stripes, printed colours and blue and white baking utensils to give it a trendy, modern, yet simple feel. We arrived on a Wednesday night, and were greeted by the friendly girls behind the counter straight away. The seating upstairs were full at the time, so we were directed downstairs where we could have it all to ourselves. As it was quiet that evening, they said that they will come and take our order at the table, but generally you order everything at the counter when you are ready upstairs. There was french cafe music playing, and all of the tables were set neatly with shiny cutlery and printed napkins, and there were menus on each table, all placed to be facing the same way. The menu is attractive, and has a good range of savoury and sweet dishes to choose from. The galette fillings are made by Karen who was the head chef at Food For Friends for 25 years, and all of the dishes are put together to order from the friendly staff behind the counter upstairs. The galettes are made from specialist buckwheat flour imported from France, and all of the savoury fillings except for the ‘Sussex Smoke’ are gluten free. We were also informed later that they can make any of the sweet crepes with the galette batter so they can be gluten free too, yay! 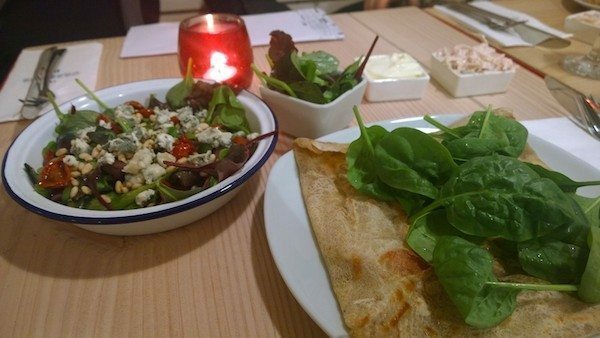 We were both here for dinner, so decided to get a savoury galette each and a salad to share. I went for the Chicken Supreme, and my boyfriend chose the Fajita galette. 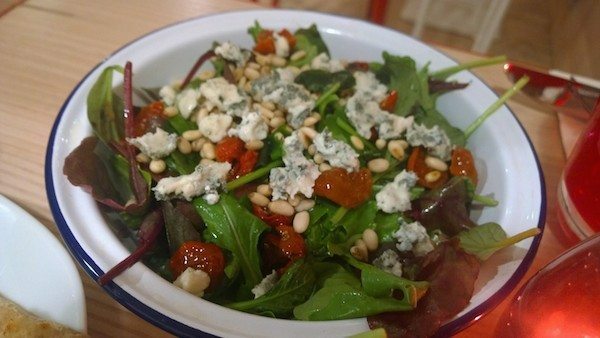 For the salad we chose delicious sounding Creperie Salad, with Roquefort cheese, sunblushed tomatoes, pinenuts, mixed leaves, rocket and a balsamic dressing. We also both ordered a glass of wine, I went for the ‘dry’ white, while my boyfriend ordered the house rose. They only have one choice of red, white or rose, and are sourced from The Jurancon area of France. The dry wine had taste notes of a classic sauvignon blanc, and the rose was sharp, but sweet and fruity at the same time. 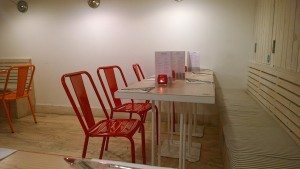 If you don’t feel like wine, they have a couple of beers to choose from, soft drinks that you are able to help yourself to, milkshakes, spirits and coffee roasted by Small Batch Coffee Co in Hove. Our food arrived after not much wait at all, and each plate was presented simply but looked lovely. The galettes each came with a small serving each of homemade coleslaw and mixed dressed salad leaves, something that is not in the menu but good to keep in mind! We ordered a large salad to share, but easily could’ve had a small between us as we had the coleslaw and salad leaves as well. The galette was perfectly thin and nice and crispy, with plenty of filling within. The bacon in my chicken supreme was crispened up to be crunchy and delicious, and they were generous with the cheese and chicken fillings. The fajita filling includes onions, peppers, chicken, cheese and sour cream which my boyfriend asked for on the side. It had a nice little kick to it, but wasn’t too spicy, and used flavoursome chicken thigh meat and tasty cheddar cheese. The salad was beautiful, and it was a nice accompaniment to our galettes, the roquefort cheese melted in our mouths, and was creamy and tasted of top quality. The coleslaw was nicely dressed, well seasoned and lovely and crunchy. After our galettes, we were both so full that we sadly decided to try a sweet crepe on our next visit. 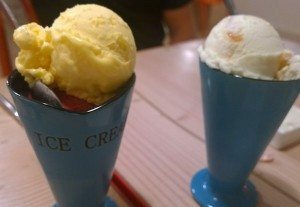 However, there is always room for ice cream, and we did need a sugar hit to revive ourselves, so we requested a couple of flavours that the staff recommended to share. My favourite was the salt caramel, and the mango sorbet was incredibly refreshing and sweet. I enjoyed the blue cone shaped cups they were served in, they were a playful touch! We also had the pleasure of meeting the friendly owner Pete while eating our ice cream, who told us about his entrepreneurial background, his love for the food industry, great service and really good food. Pete’s passion definitely shines through at The Creperie! The Creperie was a pleasure to visit and we will certainly be coming back, it’s a great alternative to your usual restaurant fare, it’s comfortable and welcoming, with very affordable prices. 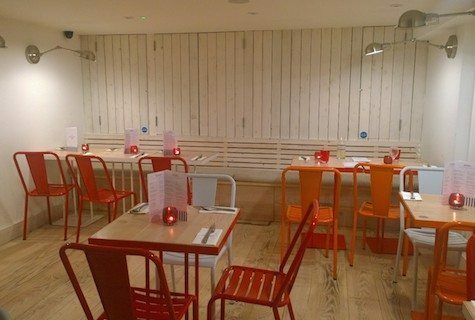 It’s a fantastic new addition to the seafront eateries, and it will be really good in the summer months for a light lunch or snack. For the winter, definitely make the most of their dinner club deal, or stop by for a decadent dessert on your way home. Thank you The Creperie for another new delicious addition to the Brighton gluten free restaurant scene!